Make yourself at home. We offer more than 300 holiday homes in Croatia. The holiday homes we offer are located in all parts of Croatia. We offer a great selection of holiday homes throughout Croatia; discover a wide range of holiday homes in Istria and a unique offering of authentic houses in Dalmatia, Kvarner and on North Dalmatian islands. If you are a nature lover and want to enjoy a peaceful holiday, we offer you holiday homes in the hinterland of Green Istria and Dalmatia, while for those who want to enjoy the company of local population, fishing, and various summer events, we offer houses on the coast or on one of many Croatian islands as holiday homes on the island Pasman, Mediterranean holiday homes on the island Brac, simple beach houses on the island Hvar. A lot of families want to feel like at home while they are on their vacation. Holiday homes offer a certain type of privacy as well as the comfort of home. Imagine sipping a morning coffee on the terrace and having breakfast with your whole family. Reading the newspaper in the shade or on sun deck chairs while the kids play around the house. Isn't it priceless ?! Holiday for which many families crave, and much more. You can find a wide selection of holiday homes in our offer. We are sure that you will find exactly what suits you best. If you need assistance please feel free to contact us via e-mail and our experts will assist you in finding the ideal location for your holiday in Croatia. Top holiday home destinations in Croatia of your choice are: entire Makarska riviera, Rogoznica, Postira, Igrane, Bol, Razanj, Opatija Riviera, Medulin, Vrboska (island Hvar), Split and Trogir riviera and Sibenik riviera. Bring your family or friends in Croatia and enjoy the holidays in one of holiday homes of our offer. As the top destination for summer vacation, Croatia has been recognized by numerous celebrities and millions of tourists which come to visit it each year. Representative of the Mediterranean, beautiful coast, rich cultural and natural beauties are praise words which are assigned to Croatia. Croatia abounds in natural beauties (National Parks: Plitvice, Krka, Kornati, Brijuni, Mljet, …) and whichever destination and home you choose for your holiday, you will always be near a National Park, Nature Park or any other natural beauty which you should visit to enrich your vacation. Adriagate.com tourist guide through destinations in Croatia contains detailed information about all destinations in Croatia so it is be much easier for you to find a destination for your summer vacations in a holiday home. Accommodation search settings will ensure a fast search of available capacities during the period when you would like to travel. Our offer of holiday homes in Croatia was selected by our private accommodation experts and our guests can comment, publish pictures and videos of the accommodations in which they have been to make it easier for you to choose a holiday home in Croatia. Check out our offer and book a holiday home just for you. 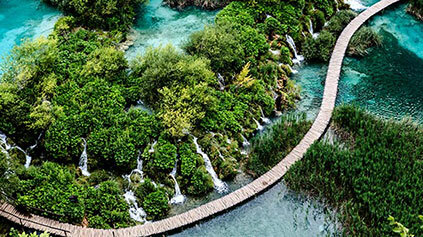 Experience the sun, sea and vacation Croatia has to offer and leave your concerns with us! Enjoy the nature, listen to the waterfalls and relax away from the city crowd. Isn’t that just what you need for your holiday? Do not worry, you came to the right place! Croatia is an inevitable destination for all those who want to simply enjoy the natural beauties and landscapes or spend an active vacation with their family and friends. You can find 8 green oasis in Croatia, just as spectacular and magical, where you can find peace and enjoy the breathtaking scenery. Due to the unique nature, clear lakes, magical waterfalls and rich flora and fauna of the National Park Plitvice Lakes are included in the UNESCO World Heritage list and certainly are worth a visit regardless of the season. The largest national park consists of 16 connected lakes, known for its clear blue-green waterfalls several meters long (the largest of which has a 78 m) will surely leave you breathless! A smaller version of the Plitvice Lakes, but equally attractive and marvelous is Krka National Park - a green paradise in Dalmatia. Walk along the paths and wooden bridges and enjoy the view of many beautiful lakes and waterfalls. Take your time to visit the most impressive waterfall Skradinski buk, take a trip to the small island of Visovac or take a swim in the clear river below the magnificent waterfalls. An inevitable destination for those who like to relax in nature and enrich their vacation with various activities should definitely visit Mljet National Park, which is located on the south of Croatia. Try kayaking and hiking, enjoy the sun on one of the most beautiful beaches and explore the park in a different way. Visit the National Park Kornati, characterized by its scarce vegetation and crystal clear sea. Enjoy the solitude of unspoiled nature, sail among the 89 islands and explore the hidden corners of this little nautical paradise. Nearby islands can be reached by daily excursion boats, and if you want to research the park on your own you will need a special permit. If you plan to soothe your spirit of adventure you should definitely visit the Northern Velebit National Park and Paklenica. In addition to the irresistible scenery, you can enjoy many activities such as hiking, biking or cave research. Climb up to the highest peaks, breathe fresh mountain air and enjoy the stunning view. Experience maximum relaxation while walking the pine forests of the National Park Risnjak. Enjoy the intoxicating fragrance of flowering meadows, hearing sounds of wildlife and explore the incredible beauty of the mountain slopes. If you are in Istria and want to enrich your history knowledge, while enjoying the delights of flora and fauna, Brijuni National Park is the ideal destination for you. Go on a trip by train to truly experience the island, have fun at the zoo "in the open", try golf, tennis or archery. Numerous legacies from the Roman period, buildings, monuments and museums are evidence of a long and turbulent Croatian history. The best way in which you will be acquainted with Croatian cultural and historical heritage is to visit cities-monuments included in UNESCO World Heritage List. 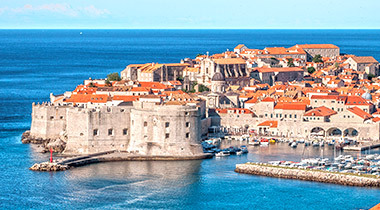 We suggest that you start your trip in Dubrovnik, called Pearl of the Adriatic. Irish writer George Bernard Shaw said during his trip, "Those who seek paradise on Earth should come to Dubrovnik." It’s an ideal call for walking around the narrow cobbled streets and exploring the many attractions: museums, forts, churches. 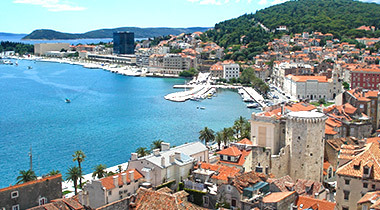 Walk on the magnificent city walls and enjoy the view of the old town and the surrounding islands. Do not forget to climb up the cable car to Srdj and bring your camera to capture the most beautiful moments. Experience Dubrovnik lifestyle and get to know the culture of the city while sipping your morning coffee on the Stradun. 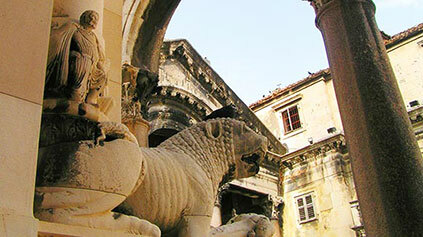 Want to know why the Roman emperor Diocletian decided to build a palace in the city of Split, 1700 years ago? It is an excellent reason to visit the city, characterized by a large number of sunny days, the rich history and easygoing and relaxed way of life. Explore every corner of the indescribably beautiful Diocletian's Palace, stroll the narrow streets and cellars to the Peristyle and Prokurative. Enjoy the view of the city from the bell tower of the Cathedral of St. Duje and get to know the typical Mediterranean way of life and enjoy the conversation with hospitable people. Do not forget to touch the thumb of Grgur Ninski and make a wish – it may come true! Not far from Split, there is a small, medieval, romantic town of Trogir. Due to its unique Renaissance architecture, the beautiful cathedral, numerous monuments and museums, Trogir was added to UNESCO's World Heritage list. Visit the Cathedral of St. Ivan, Portal of Master Radovan and the old fish market. Stroll down the long quay to Karmelengo fort or try to find Kairos in small and narrow streets. Legend says whoever finds and touches his hair will be forever happy and young. City squares, galleries and museums tell their stories which are worth exploring, and numerous cultural events contribute to creating a special atmosphere in the city. If you are on the road to Istria, Pula is an inevitable destination. 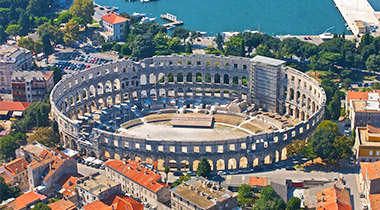 Visit the Arena, the sixth largest amphitheater in the world and one of the best preserved ancient monuments in Croatia. Arena was built at the same time as the Colosseum in Rome and was the center of gladiator fights. During the summer, you can attend the Days of antiquity and enjoy the specific ancient way of life. In the heart of Istria is Porec. Stone city streets and squares, many legacies from ancient times, monuments and sites testify the rich history of this city. Do not forget to visit the Euphrasian Basilica, which is under UNESCO protection. ULTRA EUROPE FESTIVAL (Split) - Surrende to the good vibes of electronic music at the biggest festival that brings together more than 150,000 fans worldwide. The world's best DJs such as Carl Cox, David Guetta, Armin van Buuren and Tiesto organize the real party time each year. You definitely should not miss the parties on the boat while cruising the coast and unforgettable finale on island Hvar. The festival takes place in July, due to a growing interest we recommend booking a plane ticket and accommodation in Split as soon as possible! INMUSIC FESTIVAL (Zagreb) - If you are in Zagreb in June, do not miss the biggest festival in the open! Some of the world's best performers: The Prodigy, Morrissey, Franz Ferdinand, Massive Attack, Kraftwerk, Jamiroquai, Arctic Monkeys will entertain you until dawn! Are you ready to party? Looking for a quiet beach where you will relax and enjoy clean sea while the sun is shining and your kids are busy building sand castles? Or looking for a great fun with your friends? You came to the right place. Croatia has a lot of beautiful pebble, rocky and sandy beaches that will certainly justify your expectations. One of the most beautiful beaches is Zlatni Rat on the island Brac. Because of its beauty and unusual shape that changes depending on the wind and waves, Zlatni Rat is one of the most famous symbols of Croatian tourism. This pebble beach is ideal for both outdoor enthusiasts who can enjoy windsurfing and surfing, as well as for families with children because of good access to the sea and the dense pine forest behind the beach. In the southern part of the island Krk, in Baska, take a swim at the beach Vela Plaza. On this beautiful 1800m long pebbly-sandy beach, everyone can find something for themselves. Because of the clear sea and quality offer, beach is awarded by the Blue Flag. Numerous facilities, shops, cafes and pastry shops entertain young and old during the whole day. If you're more the type who likes to relax on the beach, away from the crowd we recommend visiting Proizd beach located on the same island near the island of Korcula. Beautiful environment, clear sea and complete privacy characterize this beach. It can be reached only by private boat or taxi boat so we recommend that you take everything you need for the whole day. If you decide to spend your holidays in Dubrovnik, cool off in the clear sea on Banje beach and enjoy the view of the old town, and if you are in Split be sure to visit Bacvice beach and try out the traditional amateur sport - picigin.